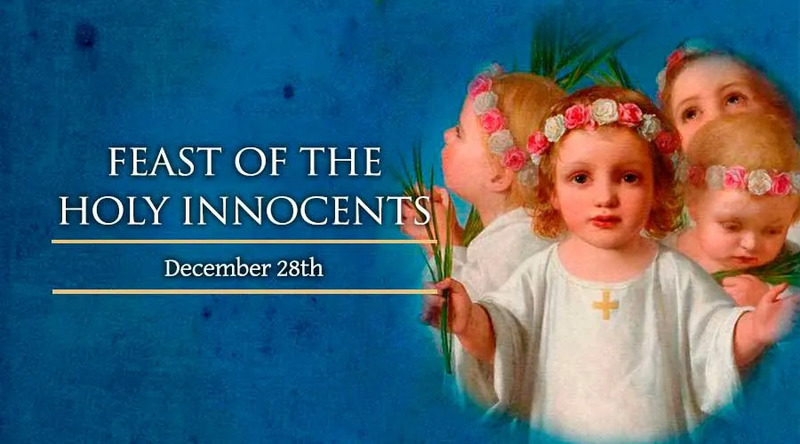 The Holy Innocents are the children mentioned in the gospel of Matthew, chapter 2:16-18. Herod, perceiving that he was deluded by the wise men, was exceeding angry, and sent his soldiers to kill all male children ages two and under that were in Bethlehem and on the boarders, according to the time which he had diligently inquired of the wise men. Then was fulfilled the prophesy of Jeremiah: A voice in Rama was heard, of lamentation and great mourning; Rachel bewailed her children, and would not be comforted, because they were not. The Greek Liturgy asserts that Herod killed 14,000 boys, the Syrians speak of 64,000, and many medieval authors speak of 144,000, according to Rev. 14:3. Modern writers reduce the number considerably, since Bethlehem was a rather small town. Knabenbauer brings it down to fifteen or twenty (Evang. S. Matt., I, 104), Bisping to ten or twelve (Evang. S. Matt. ), and Kellner to about six (Christus and seine Apostel, Freiburg, 1908). This cruel deed of Herod is not mentioned by the Jewish historian Flavius Josephus, although he relates quite a number of atrocities committed by the king during the last years of his reign. The number of these children was so small that this crime appeared insignificant amongst the other misdeeds of Herod. Macrobius relates that when Augustus heard that amongst the boys of two years and under Herod's own son also had been massacred, he said: "It is better to be Herod's hog, than his son" alluding to the Jewish law of not eating, and consequently not killing, swine. The Middle Ages gave faith to this story, and Abelard inserted it in his hymn for the feast of Holy Innocents. It is impossible to determine the day or the year of the death of the Holy Innocents, since the chronology of the birth of Christ and the subsequent Biblical events is most uncertain. All we know is that the infants were slaughtered within two years following the apparition of the star to the Wise Men (Belser, in the Tubingen "Quartalschrift," 1890, p. 361). The Church venerates these children as martyrs (flores martyrum); they are the first buds of the Church killed by the frost of persecution; they died not only for Christ, but in his stead (St. Aug., "Sermo 10us de sanctis"). The Latin Church instituted the feast of the Holy Innocents at a date now unknown, not before the end of the fourth, and not later than the end of the fifth century. The Roman Station of December 28 is at St. Paul's Outside the Walls, because that church is believed to possess the bodies of several of the Holy Innocents. A portion of these relics was transferred by Sixtus V to Santa Maria Maggiore. The church of St. Justina at Padua, the cathedrals of Lisbon and Milan, and other churches also preserve bodies which they claim to be those of some of the Holy Innocents.